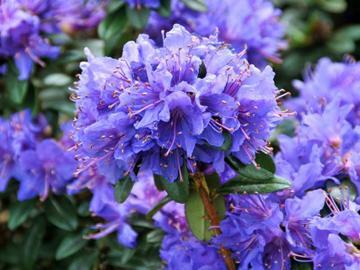 Compact, semi-dwarf evergreen with small glossy mid-green leaves and neat trusses of violet-blue flowers in early spring and often again in autumn. Moist, well drained humus rich acid soil. Happy in full sun and very hardy. Raised by Col. Sir James Horlick at Gigha, Argyllshire, Scotland in 1954.